Publisher: Peters (tracks: 1), Wayne-Leupold (tracks: 2), Leduc (tracks: 3), Edizione Curzi (tracks: 4-7). Recorded August 31-September 2, 2004, Lutheran Church St. Martin, Memmingen. It is not only the cosmic sounds from organist Harald Feller’s own arrange-ment of themes from John Williams’ Star Wars soundtrack or the intense Toccata from Enjott Schneider’s music to the movie “The Brother of Sleep” that make this hybrid SACD spectacular. 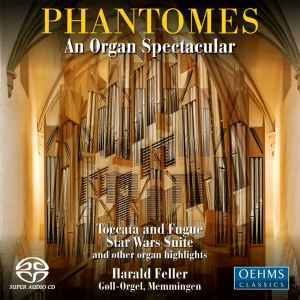 It is also the range of organ colors that can be heard on this recording – which spans an amazing breadth of repertoire from Bach’s trumpet-like, brilliant Toccata in D Minor to the warm, intimate colors of Nino Rota’s organ sonata. The multi-channel recording in surround mode makes the sound of the Goll organ in St. Martin (Memmingen, Germany) almost close enough to touch. Harald Feller studied organ in Munich and Paris, and has won many competitions, including the organ improvisa-tion competition in Haarlem, The Netherlands, in 1983. He is professor of the Academy for Theater and Music in Munich and is active as a choir director and composer as well.